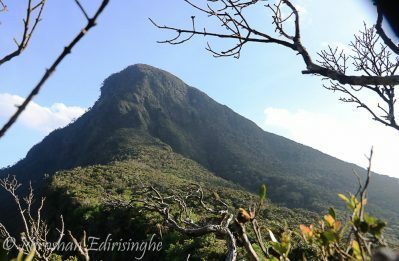 Thunhisgala (1627m)/Kalupahana is a prominent peak of Kncukles massif sitauted at center of Knuckles forest reserve. 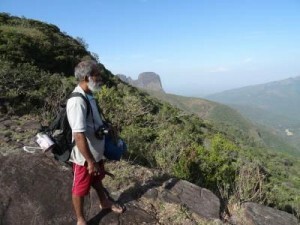 This was my back to back journey to Kalupahana within two weeks after attempted hike to Thunhisgala but ended up it’s side peak. Thunhisgala/ Kalupahana is a prominent peak of Knuckles massif with 1627m height. It is situated at center of Knuckles area-Kalupahana which was covered with Cardamom estates 30 years ago. 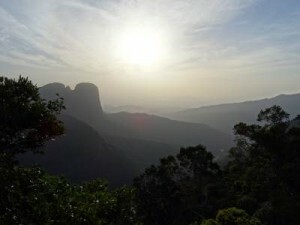 The reason for the name Thunhisgala is due to three peaks in climbing. (Thun+His+Gala) (තුන්+හිස්+ගල). Alternative meaning is three ridges meet together to form the mountain. Every year there is something on top of my to-do list and this year also was no exception. It was something mysterious and well researched by me. Been a very dry year I decided to ride my luck. 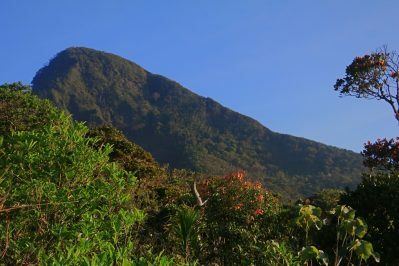 Thunhisgala / Kalupahana is one of the center most peaks of Knuckles conservation area providing the best view of the forest reserve. My attempts on searching for a guide was the most troublesome thing and hearing that the path to KMP wadiya was overgrown brought up some concerns. 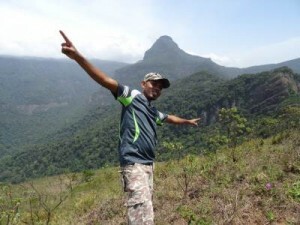 Gala Pita Gala (ගලපිටගල) is an unusual rock formation found at Kalupahana area. There are three rocks and largest one on the smaller one is balanced on flat rock surface with small contact. Previously I did hike from Kalupahana to Ohiya on foot and I wanted to do this on my jeep but I never planned to attempt this in 2015. All started when my friend Dharshana called me and said “machan must go somewhere because I haven’t been anywhere in 8 months”. He had been stuck with his PG degree so was desperate and this was the main reason why we did this plus Amila also joined us on the last moment. We got up and started packing our things and got ready. While Nava mama ran the hut keeping an eye out for the jaggery pot (remember it was kept boiling throughout the night) which was somewhat got thicker, Tony and I went out to wash. While we were washing, Samarasekara arrived as promised and went ahead to take down some of the toddy pots from the Kithul trees in the vicinity. We witnessed a beautiful butterfly as we were washing, who had come to put up a welcome show for the day. Back at the hut, Samarasekara had taken a huge pot of fresh Kithul sap from one of the trees and was in the process of mixing it with the jaggery pot. While he was at it, we started making our morning coffee and breakfast of instant noodles. There was still plenty of the jaggery given to us the previous evening left so we savored it with our 3 in 1 coffee even though it had its share of sugar. Remember pure Kithul jaggery is good for anyone even for diabetic patients as it has no harmful sugary contents. Afterwards we ate our noodles with hot chilies plucked from a nearby plant. Well it was all set for us to get going and Samarasekara agreed to show us the path to a certain distance so that we’d have no trouble getting to our target. We went up cautiously as Nava mama fell the last evening coming down. We also found Tony’s hat fallen in his adventurous slide downhill. The tree cover was so thick blocking the morning rays kissing the earth. We came across another small cave-like place above us but not suitable for spending the night. From here we could see the sun falling on the Gombaniya and Knuckles Mountain Range. Sudugala which is towards the Kalugala was also visible. There was a thick layer of mist coming from Gomara side over the Knuckles. Nava mama said we could get a better view from the Hunugala so we didn’t stay long. We went up until we came to the so-called Belumgala which is located to the left side of Hunugala. After maneuvering around the rock covered with vines, we got onto the top of Belumgala which wasn’t difficult at all. However the view was only towards the east from Udawannimana via Lakegala up to Galamuduna. The sun was almost up in the sky and taking the pictures of the eastern side was not so easy as we were facing the sun. Behind us was Gombaniya looking down on us and we could only see the top of her through the trees. Here are the pictures for you till now. It’s been two years since I first visited Meemure and ever since I’ve visited Meemure a few more times. The pinnacle of all the journeys was climbing the Lakegala last year. Every now and then I get this longing to go see Meemure and the first thing I do is call Nava Mama and ask what we could do. Well, it looks there’s enough to do in Knuckles for a lifetime. When I called this time, he suggested we do the Kalupahana area which is popularly known among the villagers as the Leech Headquarters. After a half a dozen calls, we had a workable plan and fixed the dates at the last minute as the weather was so unpredictable. Meanwhile Uncle Tony managed to get leave and join me for this exclusive journey. I met Tony at Fort Railway Station at 1pm on a hot and humid Saturday. We got into an already crowded AC bus and found those shaky jump seats in the middle. 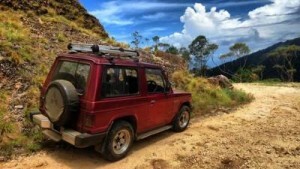 It was really tough sitting in them but we had no choice as we needed to get to Kandy as soon as possible. We reached there just after 4.30pm and went shopping. Now don’t get alarmed coz we didn’t go hunting for clothes but for the dry rations we’d need for the 3-day camping trip. Well to be honest, I’m not an experienced camper either so we all had to think carefully as to what we were going to eat and take with us. It was essential we carried the bare minimum without overloading our backpacks which would hamper our progress during the course of the hike.